Dozens of missions set out for the Arctic during the first half of the nineteenth century; all ended in failure and many in disaster, as men found themselves starving to death in the freezing wilderness, sometimes with nothing left to eat but their companions' remains. Anthony Brandt traces the complete history of this noble and foolhardy obsession, which originated during the sixteenth century, bringing vividly to life this record of courage and incompetence, privation and endurance, heroics and tragedy. Along the way he introduces us to an expansive cast of fascination characters: seamen and landlubbers, scientists and politicians, sceptics and tireless believers. 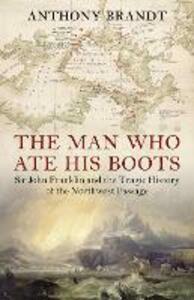 The Man Who Ate His Boots is a rich and engaging work of narrative history - a multifaceted portrait of noble adventure and of imperialistic folly.